I understand the sentiment, but I would rather sit on a rare giant pumpkin. This Saturday, on a roadtrip back from a Wisconsin cheese tour (more on that this week), I found elusive giants on which to sit and a whole patch all to myself, at Davidsons&apos; Giant Pumpkins in Harvard, Ill.
Larry Davidson has been growing giant pumpkins for 32 years on his former family dairy farm. You may know that Harvard — near the Wisconsin border, about 75 miles northwest of Navy Pier — is the home of Milk Days, at 72 years-old, one of the longest running festivals in Illinois. Giant pumpkins are so in demand as attractions and record-breakers that they&apos;re smashed to steal their seeds. 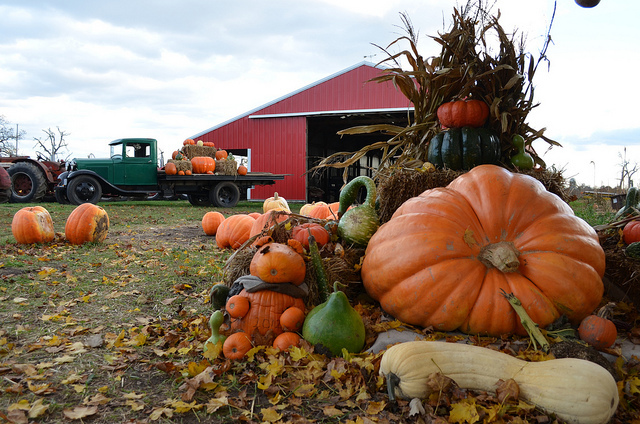 Just last week, a whole 300-pound pumpkin was stolen Hammer&apos;s Farm Market in Peoria. 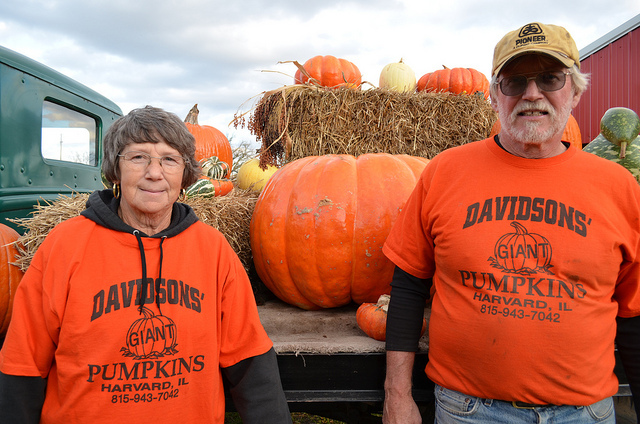 Davidson, his girlfriend Shirley Moore, and his son Terry Davidson open their giant pumpkin patch from September 29 to October 31. This year their biggest pumpkin weighs about 400 pounds. They have smaller pumpkins, including pie pumpkins, other decorative gourds in season, and even brown eggs laid by the hens out back too. This coming weekend, their last weekend, a guy comes in to carve the remaining giants, because he wants the seeds. After that, the sun sets on the pumpkin patch for another year.